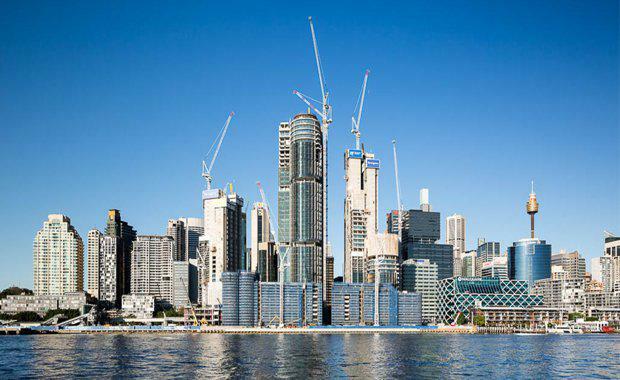 After 23 months of construction and 1.3 million worker hours, the future Australian headquarters for Lendlease and KPMG employees is well underway at Barangaroo, with the topping out of Tower Three at International Towers Sydney. Following in the footsteps of the ancient Scandinavian tradition, New South Wales (NSW) Premier, The Hon. Mike Baird MP joined Lendlease Group Chief Executive Officer and Managing Director Steve McCann on the roof of the 39 storey tower, to celebrate the completion of the building’s central core. From mid-2016, approximately 5,500 employees will move into Tower Three, which was designed in collaboration with London-based architectural firm, Rogers Stirk Harbour + Partners. Like its sibling buildings Towers One and Two, Tower Three is one of the largest high rise office buildings in Australia to receive a 6 Star Green Star Office Design v3 rating from the Green Building Council of Australia. When completed in mid-next year, the lobby and podium of Tower Three will have a range of retailers including David Jones and Campos Coffee, as well as a medical centre, a pharmacy, a noodle bar and a fresh food providore.